This Cleanser making involves the blending of traditional Ayurvedic formulae. Recommended by doctors for people with sensitive skin. 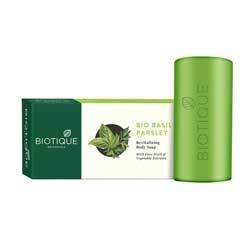 The transparent skin bar containing Coconut oil, Basil and Parsley extracts. Basil and Parsley cleanser is for skin that needs extra care. There are no harsh additives, dyes or hardening agents. It is hypoallergenic and clinically tested. Regular use makes the body free from skin problems like ringworm, scabies and dermatitis infection. It leaves the skin clean and healthy looking. Coconut Oil, Basil & Parsley extracts.